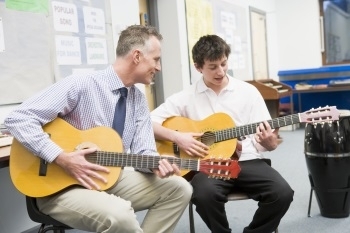 Knowing which musical instruments are owned by the school and which is owned by students is obviously something that needs to be closely monitored. However finding an ID labelling system that clearly states the property of the school and which can be used on such small equipment, can be difficult. This is where our Mini Mark Labels can help. Being so small they are ideal for labelling musical instruments. What’s more, they are particularly well-suited to this purpose as even with musical instruments that are handled continuously the text won’t come off the label, even with 'sweaty' hands etc. Due to their size, they are also ideal for labelling microphones and recording equipment. With the Mini Mark Label, the required information is engraved into acrylate label material giving a permanent high contrast, a durable and tamper-proof image suitable for all environments. The label is then affixed easily to the instrument using a high-performance adhesive which is suitable for almost all surfaces and which will give high initial adhesion. In this way, the image cannot be ‘wiped off’ – for it is permanently engraved into the label. Any attempt to tamper with the label is evident and indeed the label will fragment if removal is attempted. This, in turn, is a valuable theft deterrent especially if everyone in the school knows that this is the case. 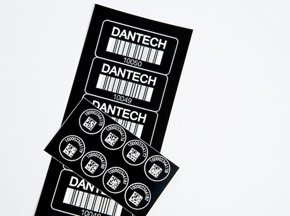 The Dantech Mini Mark Labels can be provided with white text on black or silver material with black text. Alternatively, call us on 01354 688488 or complete our contact form for more information.